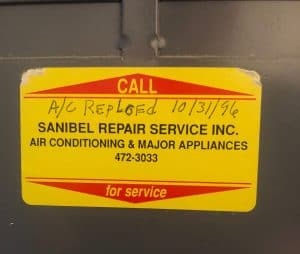 Service Sticker Brings Back Great Memories - Sanibel Air & Electric, Inc. Sometimes during the course of your normal day something comes along that hits you out of the blue. I was recently asked to look at a condo as a follow up to a four-point insurance inspection. As I entered the home there was a certain familiarity about the home although I couldn’t place my finger on it. But after 30 years of working on the islands that is to be expected. So I shrugged it off and went about my business. I checked what I needed to and finally ended up at the breaker panel, then opened the panel, and there it was. It stopped me in my tracks. There, on the bottom, was a very familiar sight. A sticker. It was one of our old Sanibel Repair Service stickers. And on this sticker was a handwritten note, “A/C Replced 10/31/96”. A couple of things jumped out at me as the memories began to resurface – the word “replacement” was spelled wrong. Firstly this sticker had been placed inside the breaker panel more than 22 years ago, secondly it was on Halloween, and finally the handwriting was that of my recently deceased long time partner, father and friend, Dan Hayes. All the memories came flooding back in an instance. 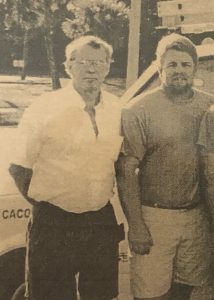 Dan and I had received a call for an A/C problem from this particular home that morning, we rushed over because it was hot and we determined that an A/C replacement was needed so we got to work right away. We worked side by side as we had done countless times before to complete the job. Each part of the sticker brought back a different memory and the word “replacement” was probably spelled wrong because we worked a long hard day to get these people back in air conditioning. The date on the sticker also made me think of the early years when it was just my Dad and I and all that has happened since. The date also reminded me that it we did the job on Halloween. I remember wanting/needing to get home to take a very anxious 2-year-old trick-or-treating. She is now 24. So a little hand written note, written 22 years ago, brought back some great memories. Thanks Dad. Love you.